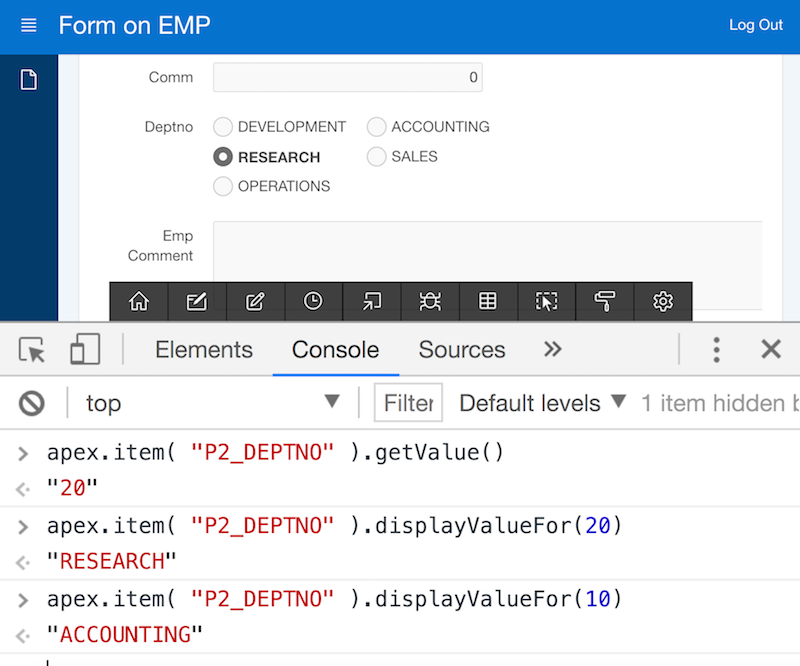 Given that, let's now get into the apex.item functions: First, we will need a form to play with - create one on the well-known table EMP. 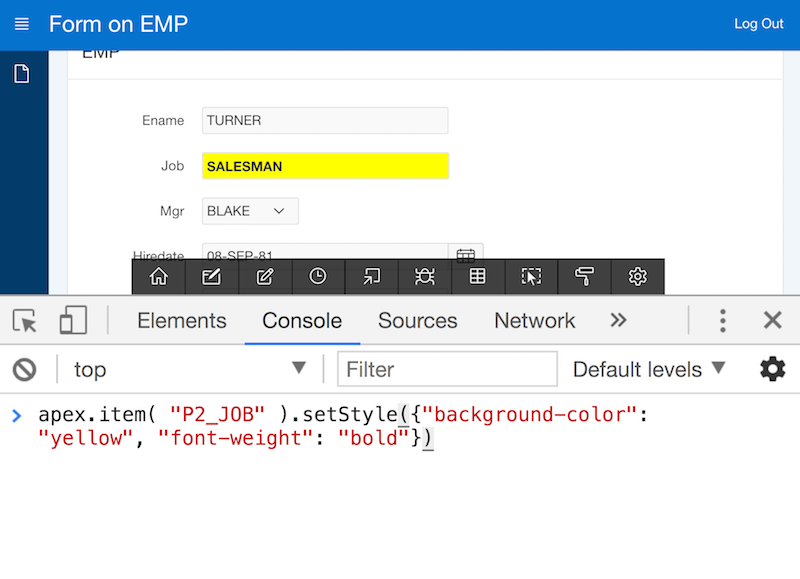 Make sure that it contains a bit more than simple text fields (select lists, radio groups or check boxes and perhaps a date picker). 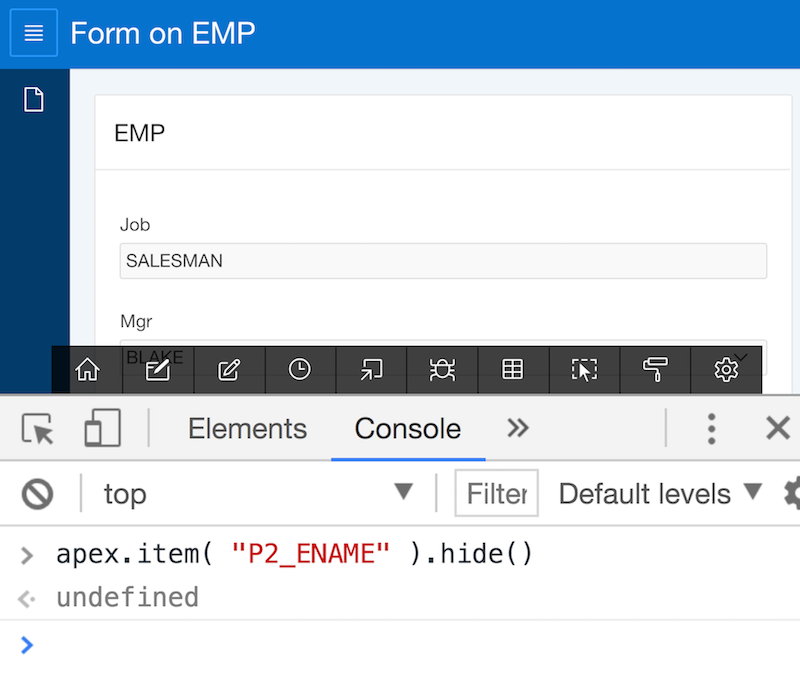 apex.item provides special support for page items which are based on a list of values (select lists, radio groups or checkboxes). As with other item types, $v or getValue() retrieves the selected value. Multiple values (for check boxes) will be returned as an array. You will get the Return values, which are most often numeric keys. But sometimes, the developer needs the Display value - which is no problem for the displayValueFor() function. displayValueFor() only works for page items where the full list of values is known to the browser - which is the case for select lists, radio buttons or check boxes. For a Popup LOV, where the list of values is now known to the browser (it would typically be too large), the function will not work. 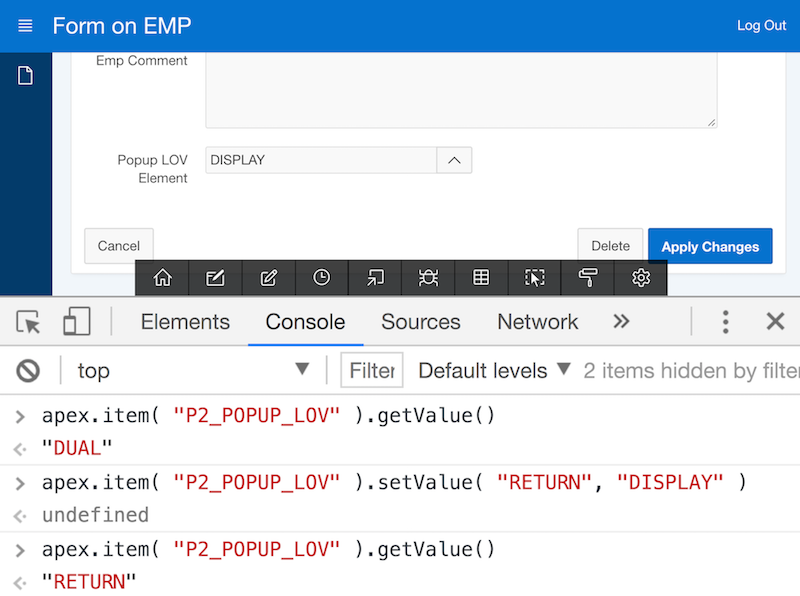 As already mentioned, for Popup LOV items the browser does not know the list of values. So, if only the return value were provided, APEX would not know what to display, so it will actually display the return value. 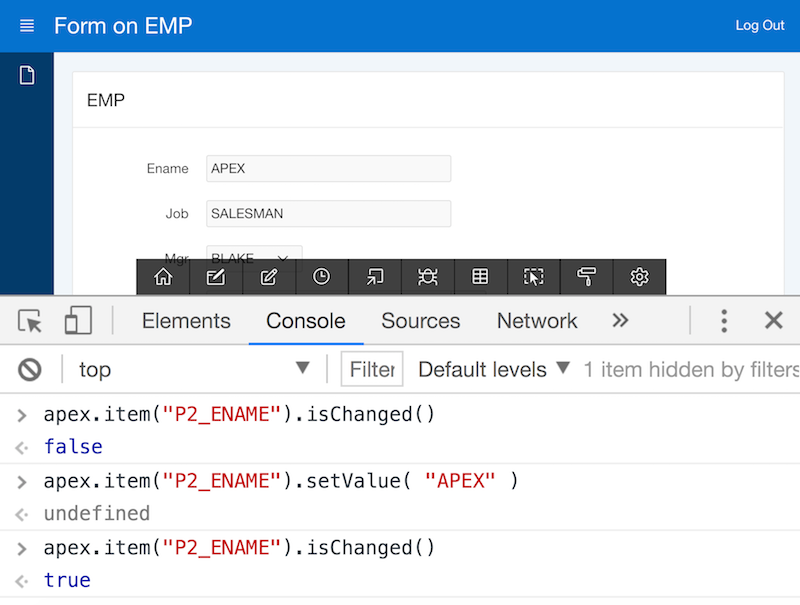 Thus apex.item.setValue() allows to explicitly pass the display value as well. Note that you only need this for item types like Popup LOVs. setValue() also allows to suppress the change event. By default, using setValue() will lead to the same sitation as if the end user had manually modified the item value. So the browser will fire the change event, Dynamic Actions for that change event will be fired and their functionality will be executed. In some situations, developers want to change a page item's value but to not have dynamic actions fired. For these cases, use the third ("pSuppressChangeEvent") argument of the setValue() function as follows. Now dynamic actions to be executed on change will not execute. 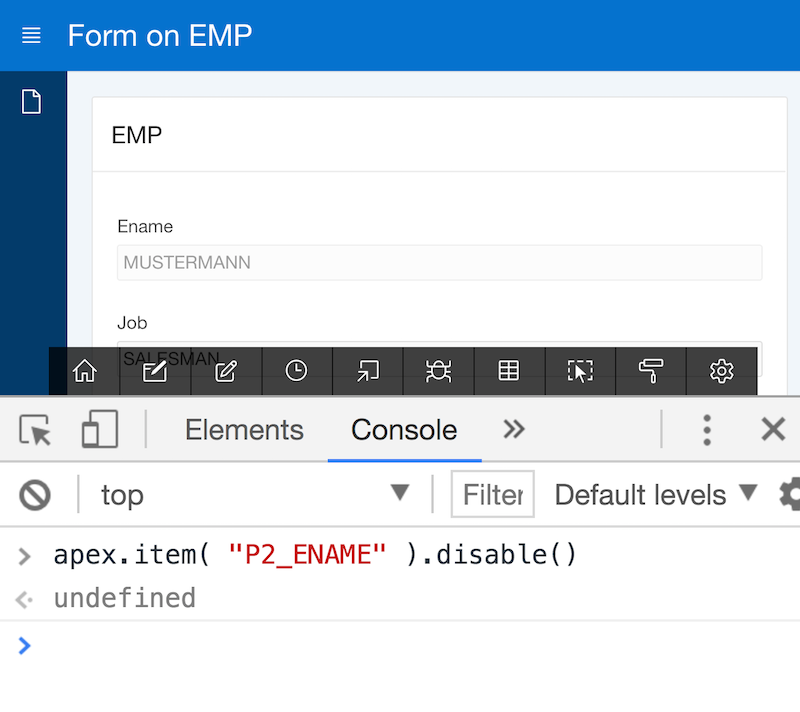 And apex.item can do even more: You'll find functions for all the things you can do with dynamic actions (show, hide, enable, disable, set focus, assign a CSS style). The isChanged() function is also worth a closer look. Right after page load, all page items have not been modified. Thus, the function will return false. 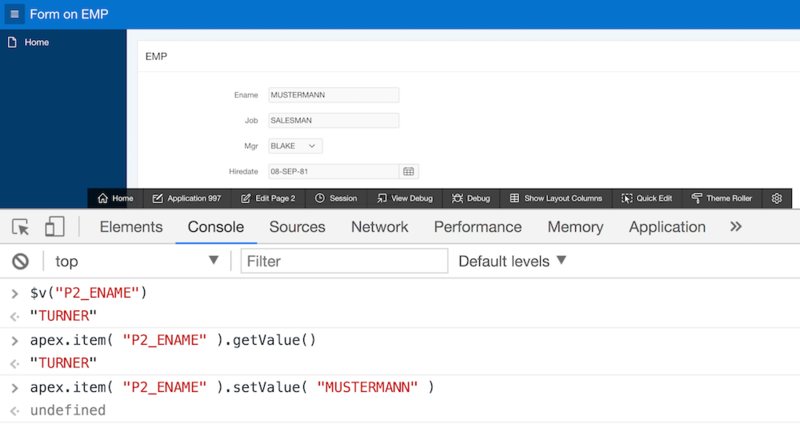 As soon as the end user changes values (or setValue() has been called), the isChanged() function will return true for that page item. So you can use isChanged() to determine whether item values have been changed - which can be pretty useful when it's about to decide whether, for instance, an AJAX request to the server is required. If no item has been changed, you might save on roundtrips to the server. Has the value of a page item been changed? The isChanged() function knows the answer.